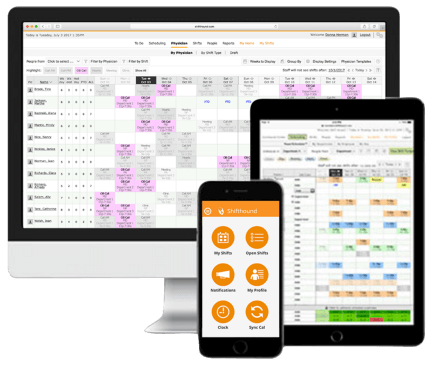 For Staff: Next-generation, 100% web-based scheduling and open shift management that transforms scheduling for departments, facilities or enterprise‑wide. For Physicians: A fresh and affordable approach to provider scheduling with a rich feature set that handles all the unique aspects of scheduling physicians and other providers. Track and store credentials in the cloud. Access from any mobile device and get expiration alerts via text or email. Fully integrated with ABILITY SMARTFORCE™ Scheduler to display credential status while making staffing decisions and avoid safety and regulatory compliance issues. Time and attendance application with geolocation supports punching in and out from mobile phones. Eliminates the need for punch clocks and simplifies collection and tracking of time and attendance data. Sends text alerts when a punch is missed. Fully integrated with ABILITY SMARTFORCE™ Scheduler with real-time punches displayed right on the schedule. We dramatically reduced labor costs by close to $1 million in the first year. What used to take me hours each day managing the schedule now takes me minutes. We went from online live to two hundred employees fully trained in one week. Questions? Comments? Give us a call, we’re here to help! See a live demonstration of any ABILITY service. ABILITY offers affordable solutions for any budget.